On a raid from New Bern Union troops led by Gen. J.G. 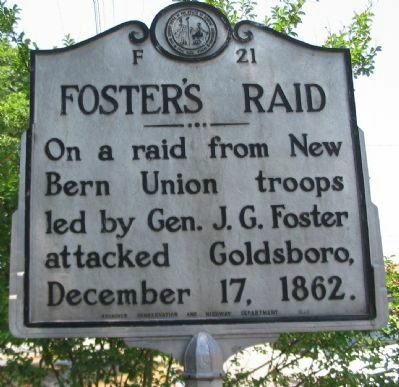 Foster attacked Goldsboro, December 17, 1862. Location. 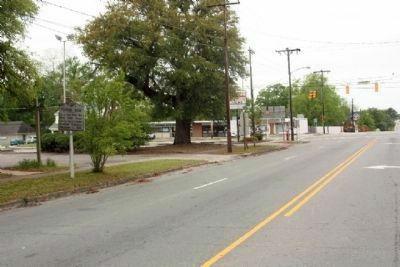 35° 23.18′ N, 77° 59.912′ W. Marker is in Goldsboro, North Carolina, in Wayne County. Marker is at the intersection of West Ash Street (Business U.S. 70) and North George Street, on the right when traveling east on West Ash Street. Touch for map. Marker is in this post office area: Goldsboro NC 27530, United States of America. Touch for directions. Other nearby markers. At least 8 other markers are within walking distance of this marker. 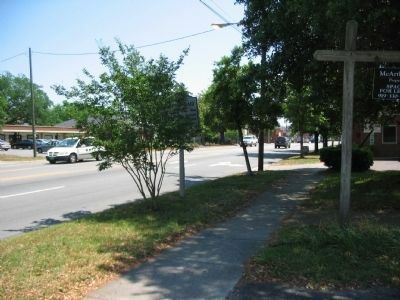 Kenneth C. Royall (within shouting distance of this marker); Sherman's March (about 500 feet away, measured in a direct line); North Carolina Railroad (approx. 0.2 miles away); Gertrude Weil (approx. 0.3 miles away); Charles B. Aycock (approx. 0.3 miles away); Wm. T. Dortch (approx. 0.3 miles away); Wayne County Veterans Memorial (approx. 0.4 miles away); Seymour Johnson AFB History / 4th Fighter Wing History Memorial (approx. 0.4 miles away). Touch for a list and map of all markers in Goldsboro. More. Search the internet for Foster's Raid. Credits. This page was last revised on June 16, 2016. This page originally submitted on June 5, 2010, by Craig Swain of Leesburg, Virginia. This page has been viewed 704 times since then and 6 times this year. Photos: 1, 2. submitted on June 5, 2010, by Craig Swain of Leesburg, Virginia. 3. submitted on April 21, 2013, by Mike Stroud of Bluffton, South Carolina.